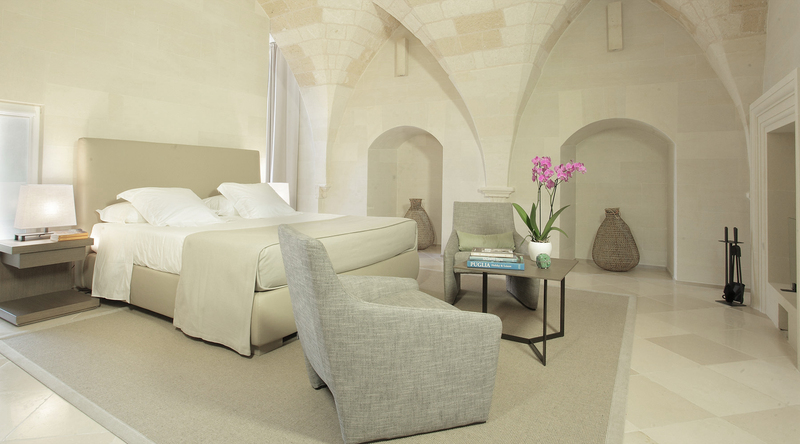 Through a short Lecce stone staircase, guests can reach the most beautiful suite of the Resort. It is very spacious, with a total area of 550 square feet, and also very bright. It is comprised of a double bedroom, a separate sitting room and an ample bathroom. The double bed is Queen size; a sofa bed opening into a French-size bed is present in the adjoining sitting room. 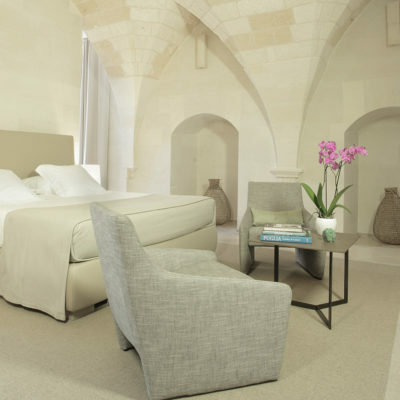 This suite is comfortably furnished following the style of the entire Resort: a blend of modern and antique, enhanced by the original star-pinnacled ceiling that guests can touch with their own hands. 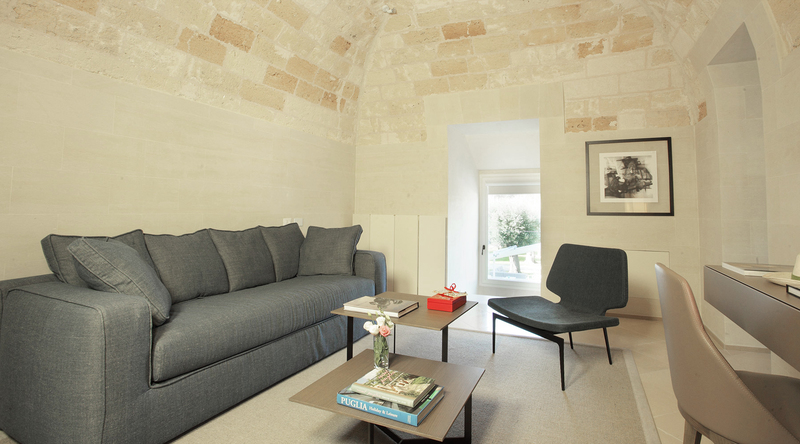 There is plenty of space, and the suite also features some decorated alcoves and a stone fireplace. Being on the upper floor, you can also find a private terrace that offers a beautiful view of the garden. The suite is equipped with a 40 and 48-inch TV, complimentary SKY HD and Wi-Fi, air conditioning, stereo system and a courtesy Lavazza coffee machine. A selection of complimentary coffee capsules and infusions is provided. All room services are easily managed by the guests through a touchpad. The ample bathroom features a very spacious shower complemented by a free-standing bath tub. Organic toiletries, accessories and a hairdryer are provided. The Suite has a safe. Deluxe rooms have a King or Queen-size bed and they are stylishly furnished in our signature contemporary-meets-antique style, providing elegance and comfort. Stone or timber architectural features provide plenty of character. 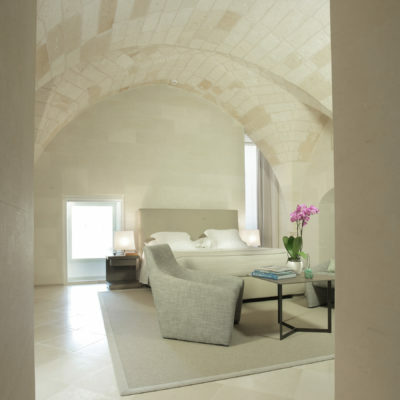 Through a Lecce stone staircase, guests can reach the most beautiful suite. 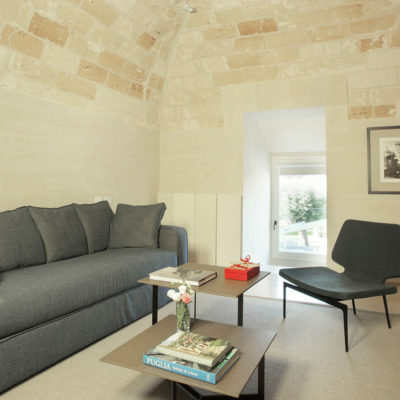 It's furnished following the style of the Resort: a blend of modern and antique, enhanced by the original star-pinnacled ceiling that guests can touch with their own hands.